ExpatCruise had the most liked content! But really with 6500 plus posts it is not practicable to review more than the last few pages. If it has become a problem or issue maybe close and start new each month. ExpatCruise replied to Jason's topic in Let's Talk Cruise! The market is a wonderful thing. Really doesn't matter if you are talking about cruise cabins, apples, or service fees. The market if left along will always adjust and find the true value. Simple fact is Disney's final payment and cancellation policy was costing them bookings or income per cabin so after looking at this they have adjusted the policy. Only Disney really knows which ones, but they believe that by changing the policy they we make more profit. Time will tell if they made the right call here. Andi Have a great trip and enjoy your week on the river. Looking forward to the details when you return. 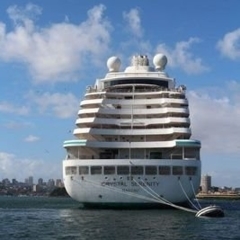 I see these kind of reports and the red flags go off, another start up cruise line. But this one does have several cruise professionals on the management time. They report "Blue World Voyages' initial departure is scheduled for May 2019 in the Mediterranean, visiting locales such as Italy, Greece, Spain, France, Portugal, Corsica and Croatia. Next up will be England, Scotland and Ireland." But what they do not tell you is they do not even have a ship or the funding for a ship. They have a option for a ship that will require much rebuilding to make into the glossy photos shown here. They do not even have the money for completing of the option on the ship. So who really thinks they can get the funding, the ship, rebuild the ship and set up a cruise for only 10 months from now? Many try to start cruise lines and most fail.